This article with Keith Johnston is the first in a series of posts where we ask OLH authors to elaborate on their work and to think more broadly about its general uptake. This interview relates to the first research article published at the Open Library of Humanities journal: Johnston, K M 2015 “3D UK? 3D History and the Absent British Pioneers”. Open Library of Humanities, 1(1): e2, pp. 1–25, DOI: http://dx.doi.org/10.16995/olh.19. I’m a Reader in Film & Television Studies at the University of East Anglia. I worked as a producer in the UK advertising and media industries for almost a decade before returning to academia, where I research and teach on film advertising, and the history of film technologies such as colour and 3D (largely in the context of British film and media history). I’d like more people to be aware that Britain had a small but burgeoning 3D film production hub in the 1950s – and that the British experience offers a different view on the ‘known history’ of 3D which rarely looks beyond the 1953-55 period of American 3D feature films. 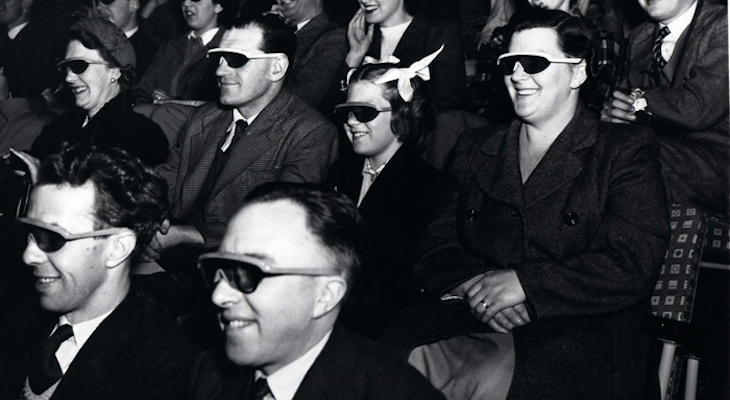 What led you to investigate the history of UK 3D cinema? While researching American 3D film trailers for my 2009 book Coming Soon: Film Trailers and the Selling of Hollywood Technology, I saw a brief mention of 1950s British 3D. The idea that there was a largely unknown and undocumented history around this technology, time period and national context fascinated me, and made me want to know more! The British 3D films represent a different view of 1950s stereoscopic 3D, one that I think casts new light on what 3D offered for filmmakers in the 1950s, as well as those exploring the potential of 3D now. Most people know about the 1950s and 1980s American 3D films, but I think it is important to remember other stories about 3D film – and the British experience is such a strong example of 3D being used for a range of different purposes, including filming ballet, advertisements, foreign travel and producing 3D animation. The main British 3D company, Stereo Techniques, is still a mystery in key areas: where was the company based and constituted, who else did they employ (beyond the key names identified in my article), what deals did they have with producers and exhibitors, what did the audiences who flocked to see these films actually think of them? There are also holes in the physical film archive of Stereo Technique films: the BFI only holds partial versions of some of these films, with many only known through reports in the trade press or newspapers. I’d love to think that the article might prompt people to rediscover long lost prints of the missing films, particularly the commercial work. The full article is freely available to read. Featured image released and used under an Open Government License.